Solar panel helps us to take full advantage of solar energy which is clean, inexhautible and pollution-free, and it converts sunlight into electric. In this way, we can help people in remote areas without mains supply and lack of electricity, and light up nights and bring people hope there. Superiority: high quality anodized aluminum frame, high efficiency long life, easy installation, strong wind resistance, strong hail resistance. 1. Management team : We have employed years of experience engineers to take charge of the overall managemnt ,especailly the technical managemnt and quality management . 2. Introducing ISO management ,We are awared CE certificate . 3. QC Inpection:It is our company policy that all the finish product should be inspected by our specialzed QC in every manufacure steps and beofore the shipment. 1. Reply your inquiry in 12 working hours. 3. Customized design is available. 6. Professional factory : We are manufacturer, specializing in producing all kinds of steel poles for more than 15years, competitive with good quantity. 7 Sample: We can send out sample for test in one week if the order quantity is big enough. But the shipment charges is usually paid by your side, the charges will be rebounded when we have formal order. 8. As an honest seller, we always use superior raw material, advanced machines, skilled technicians to ensure our products to be finished in high quality and stable feature. Welcome to contact us or visit our company. If you are in need of our products, you may let us know and we will offer you good products with great quality and service. Is solar power difficult to use? Although the production of solar panels incorporates a high-tech manufacturing process, it is really very easy to use a photovoltaic system. Solar panels have no moving parts to wear out, they can be used alone or in combination with other energy sources, and they are silent, reliable and long lasting. What can you power with Photovoltaics? A properly designed photovoltaic system can supply electricity for many applications, from small remote lighting needs to megawatts of power for large utility companies. An advantage of photovoltaic power is that it can do anything a traditional power generator can do, only without consuming pollution-causing fuel, or requiring noisy motors. What is a PV system? A PV system consists of all the equipment and materials needed to generate solar energy, including solar panels (often called modules), a support structure, wiring, an inverter, a meter and other equipment as required by a specific application. Kelan's PV system for commercial buildings, and ET Solar system for residential uses are examples of complete PV systems. What is a solar module? 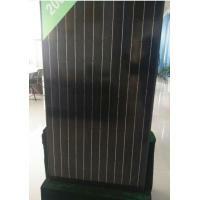 Solar modules are series of solar cells, wired together and enclosed protect them from the environment. They are often referred to as in self-contained glass units to solar panels as well. Solar cells are solid-state devices in which photons (or packets of light) collide with atoms. This process transforms the resulting into electrons. These electrons flow into wires connected to the cell, thus providing electric current to appliances, lighting systems or other electrical loads; and all of the power comes directly from the sun. Photovoltaic (PV) power is a term used to describe the process of converting sunlight into electricity with solar cells. These cells are specially constructed from semiconductor materials, and are treated to generate a flow of electricity when sunlight shines on them. 10 years workmanship and raw materials warranty. The output power is not less than 90% in 10 years and it is not less than 80% in 25 years. 1. Gird-connected power generation system. 2. Off-grid power generation system, small solar system for fans, TV, computer, home electrical facilities. 3. Building-integrated power generation facilities. 2019 Popular size, 360W Monocrystalline panel, stable performance.